I think the more savvy among us are aware that the DVD market is often ledden with scams designed to extract your last home-entertainment dollar. Movies are released then re-released with “extra bonus footage!” and “double secret extra hidden footage!” that keeps you coming back for more. By now, I think there are at least 94 different editions of the American Pie movies. That said, you have no one to blame but yourself if you wind up purchasing The Lord of the Rings: The Two Towers when it comes out on DVD this coming Tuesday. They might as well call that the “Sucker Edition” when you consider all the cool extra stuff they’ll insert with the Platinum Series Extended Edition in November. Honestly, I’ll probably stay away from even that and wait until after Return of the King since they’ll probably bundle all of the Platinum Series together with a special collectors edition hollow bust of Sean Astin’s head that you’ll be able to carry around like a thermos. 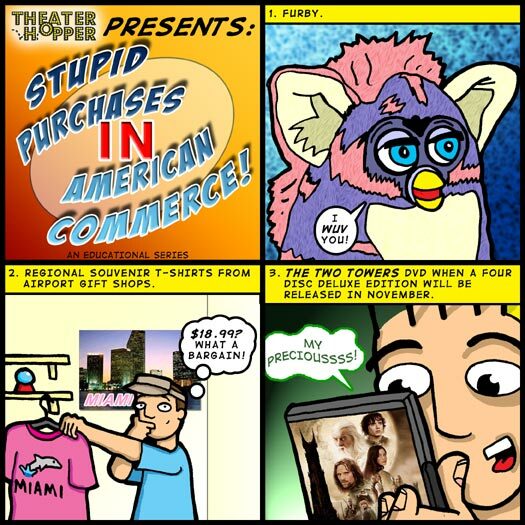 Theater Hopper Presents: Stupid Purchases In American Commerce! 2. Regional souvenir t-shirts from airport gift shops. 3. The Two Towers DVD when a four disc deluxe version will be released in November.